Learn how to maintain and enhance professional patient respect in challenging situations, and ways to support colleagues through difficult conversations. Cognitive Institute is recognised by the NSQHS for our Open Disclosure courses, providing you with the communication skills to achieve “expert” under the Framework. Read about Mater Health Services Brisbane’s implementation. appreciate the response clinicians may have following an adverse outcome and understand emotional barriers that can impact on conducting effective disclosure conversations. 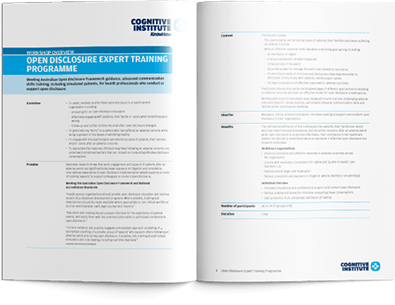 The format for the Open Disclosure Expert Training programme comprises short lectures, video scenarios, reflective exercises, small group facilitated discussion, group activities and skills rehearsal. Brief didactic presentations provide the focus for small group sessions in which participants are able to share experiences and pool knowledge, enabling critical comparison of their skills with their peers and peer learning. Video case studies enable participants to analyse and reflect upon their own skills. Participants put into practice the concepts and skills learned as they work through challenging cases, role-playing with professional actors. In particular, participants rehearse the A.S.S.I.S.T.© model for conducting these difficult conversations. Each participant is given the opportunity to practise skills, with immediate feedback and coaching from the facilitator. Participants are encouraged to identify areas known to cause them difficulty or anxiety, and actors are coached by the facilitator to focus on these areas to provide an opportunity for skills improvement. 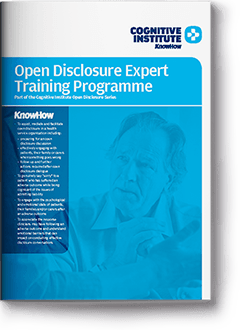 The Open Disclosure Expert Training programme is ideal for clinical directors and senior clinicians needing to support and conduct open disclosure in their organisation. The Open Disclosure Expert Training programme will provide the following outcomes. Reduced complaints and exposure to litigation (where liability is not admitted). Protection from unintended admission of liability. The ultimate beneficiaries of this training are the patients, their family and carers who may have improved acceptance, and therefore recovery, after an adverse event when open disclosure is conducted effectively. Their confidence in the healthcare system can also be re-established when all elements of effective open disclosure are properly conducted. Meeting Australian Open Disclosure Framework guidance, advanced communication skills training, including simulated patients, for health professionals who conduct or support open disclosure.